WHAT: MOUNTAIN BIKE / HYBRID TRAIL TOUR – 334-350 miles. Trip begins with charter transportation from near Georgetown, Washington, DC to Pittsburgh, PA, departing Georgetown area at 8:00 a.m. and arriving in Pittsburgh approximately 1:30 p.m., giving participants time to explore the Pittsburgh area on their own prior to the start of trail riding on the second day. Trip ends on the eighth day, back at the shuttle starting location in Washington, DC. 35-64 miles per day, with shuttle options to shorten daily distances. TERRAIN: Level to 1% grade (See profile elevation map on tour highlights page). Packed dirt and crushed stone surface. 6-8 feet wide. Mountain, hybrid or cyclo-cross bicycles required. RATING: Easy. The terrain is flat. The sometimes bumpy canal surface requires a moderate fitness level. This tour combines the Great Allegheny Passage (GAP) Rail Trail, with the Chesapeake and Ohio Canal Towpath, to provide a scenic, exhiliarating, adventure-packed seven days on the trail plus time to explore Pittsburgh and Washington, DC, tour Fallingwater or Kentuck Knob, a Frank Lloyd Wright architected home, civil war battlefields, and Harpers Ferry, Shepherdstown, and Leesburg. The tour originates with shuttle from Washington to Pittsburgh, where participants will have time to explore and/or bike on their own. Optionally, fly into Pittsburgh and out of Washington and avoid the shuttle. Explore the viaducts, tunnels, and area history on day three, and end with a fast, scenic, 23 mile downhill railroad grade that parallels the Western Maryland Scenic Railroad route to Cumberland. In Cumberland, the trail changes from rail bed to Canal Towpath, as we start down the C&O Canal on Day 5, pass through the Paw Paw tunnel, and choose whether to ride the last 12 miles on the paved Western Maryland Rail Trail or the C&O Canal, before ending in Hancock, MD. On Day 6, you can see Fort Frederick, an early stone fort, and Antietam Battlefield, if you choose, before riding into Shepherdstown, WV. Visit Harpers Ferry on Day 7, then see Monocacy Aqueduct before ending in Leesburg, VA, where you can antique or outlet mall shop (we'll shuttle your purchases for you the final day), or simply relax. On the final day, you return across White's Ferry, and finish the ride through Great Falls National Park, ending in Washington, DC in the afternoon, where you can spend time sightseeing Washington, DC. Whether one spends an evening in town, or a few days, there is much to see and do in Washington, and this time of year is less crowded, compared with the summer. The Great Allegheny Passage combines several Pennsylvania and Maryland rail trails into a spectacularly scenic route free of traffic through the Western Maryland and Pennsylvania mountains between Pittsburgh and Cumberland. With trail connections between Frostburg and Cumberland, MD completed in 2006, and the final mile into Pittsburgh completed in 2013, the GAP extends from the C&O Canal to create a 350 mile trail between Washington, DC and Pittsburgh, PA, and offers access to some of the most beautiful scenery of the Atlantic states. The trail features three tunnels, including the 3,294' Big Savage (the second longest in western Maryland), a crossing of the Mason-Dixon Line (MD-PA border), the Eastern Continental Divide, stunning vistas of the Cumberland Valley from the trail, two long viaducts, and mature state forests offering colorful canopy along the cascading rivers. 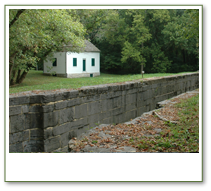 Construction began on the Chesapeake and Ohio (C&O) Canal in 1828, the same year as the B&O Railroad was begun. The railroad won the race to the west, beating the canal to the Ohio Valley by 8 years. The 184-mile canal cost $22 million, and includes 74 lift locks, and 11 stone aqueducts over Potomac tributaries. The first canal boat to travel end-to-end along the canal did so in 1850, more than 150 years before us. The canal was used commercially until 1924 when floods destroyed it for the second time. The towpath, although no longer used to transport tobacco, furs, iron ore, and other goods, is currently maintained as a National Park with trip highlights including historic Harpers Ferry, Kilian’s Cave (and others), and the Paw Paw tunnel. The variation between the rail-trail and the canal are felt in the surroundings, architectures, and the water routes that align each trail. 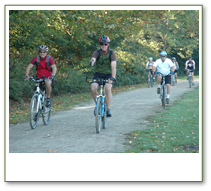 Spring rides offer nice views through budding hardwood forests to the Potomac River. Summer offers a shade canopy from typically hot temperatures, and fall trips offer cooler temperatures with stunning views of hardwood forests normally reaching peak color in the second week of October. All year long, there are breathtaking vistas of the raging Great Falls of the Potomac River, as well as serene, peaceful moments along quiet stretches of the river. The first day includes chartered transportation from Washington, DC, where the riding later ends, to Pittsburgh, PA. You will depart the Georgetown, DC area at 8:00 a.m., and arrive in Pittsburgh about 1:30 p.m., allowing time to unwind, or explore on your own. Use the time to view downtown Pittsburgh from the Duquesne Incline, to bike to mile zero in Point State Park, ride metropolitan trail connections, cross the Hot Metal Pedestrian Bridge with a view of Pittsburgh downtown, or relax and enjoy Pittsburgh's vibrant night life before setting out on your seven day trail ride. On the first evening, the group will over-night along the trail on Pittsburgh's South Side, or Waterfront area (no other company gives you this luxury). 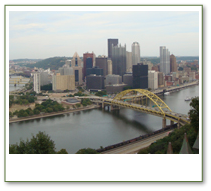 For participants who will be flying in for the tour, consider the option Southwest airlines offers, to fly into Pittsburgh and out of Washington, as it will save you from spending 5 hours shuttling between the cities. Start day 2 of your GAP ride at the Pittsburgh Waterfront, the new trailhead opened in June, 2011, and ride the paved trail sections out of Pittsburgh to McKeesport, where you will quickly leave the bustle of the city and it's heavy industry behind. Here, the trail leaves the Monongahela River, and continues along the meandering Youghiogheny River through scenic forests. During the day, you will experience many highlights including Dravo Cemetery, West Newton (where the restored depot serves as a trail headquarters with a rail car sitting alongside), Cedar Creek Park, the small coal-era towns of Whitsett and Adelaide, and Colonel Crawford's cabin in Connellsville, where we stop for the night. Throughout this day, signs of coal mining operations and coke ovens of the past are most evident, and if you are observant you will see the coal seam in the bluffs along the trail. You start the third day with an uninterrupted and unspoiled 16 mile stretch of trail through Ohiopyle State Park, where you hear class-III-IV Youghiogheny River whitewater cascading below you. After a few hours on the trail, you cross the Youghiogheny River on the High Bridge, travel across Ferncliff Peninsula, and cross the Yough again on the Low Bridge, signaling your mid-day destination of Ohiopyle, where we head for Fallingwater or Kentuck Knob, a Frank Lloyd Wright architected home near Ohiopyle, to tour the house and grounds, then return to Ohiopyle for our lunch. Now above Ohiopyle Falls, the third day winds down with an 11 mile riverside ride along the Middle Yough, a class I-II section of whitewater, that leads you to Confluence, where our lodging and a home-cooked italian dinner awaits. Optionally, the group may have a fire in the fire pit. This town, named for the confluence of Laurel Hill Creek, the Casselman River, and the Youghiogheny River, was referred to as "Turkey Foot," by early settlers, since viewed from the surrounding high bluffs, the confluence of the three rivers looks like a turkey's foot. The trail continues in a mild uphill manner (just .8%), as it leaves the Yough behind in Confluence, and begins to follow the natural flow of the Casselman River. One of the favorite views for tour participants is the High Bridge--Pinkerton Tunnel and Shoefly--Low Bridge stretch that comes just before the first Rest "Go." Since the tunnel is unsafe for passage, the trail makes a 1.45 mile detour around Pinkerton Horn, to reach the other end. Interestingly, the railroad did the same for a while, after timbers that lined the tunnel burned and caused it to be closed for a long period of time, before being repaired. Perhaps in the future, funds will be raised to restore the tunnel again, and cyclists will have the option of riding the shoefly or directly through the tunnel. Late in the morning, you will leave the Casselman River, and begin to climb an open ridge toward the Eastern Continental Divide. Watch and listen for trains laboring up the same grade as you, on tracks across the ridge. Soon, you'll cross the Salisbury viaduct, lunch in Meyersdale, then cross the curving Keystone viaduct enroute the the trail's highest point near Deal. After this, you'll spin easily downhill and past the Eastern Continental Divide, on a grade of up to 1.75%, and through the Big Savage Tunnel, one of the overall highlights of the trip. As you exit the eastern portal of the tunnel, you are treated to fantastic views of the Cumberland Valley, and the White Cliffs nearly 11 miles away. You will soon cross the Mason-Dixon line into Maryland, pass through the Borden Tunnel, and reach the town of Frostburg, which offers historic homes, a beautiful brick railroad depot, and a small-town way of life. Look around the depot area (especially if the train is at the station), then continue the last 16 miles downhill to our oasis of Cumberland, where the group will overnight. Take a quick tour of the C&O Canal visitor's center, if you are in before closing time of 5 p.m. To capitalize on the variety of dining available in Cumberland, we make this dinner "on your own," but often go as a group. Day five will begin with a scrumptious hot breakfast, after which you will set out along the water-filled canal ( watch for otters, great blue heron, beaver, deer, and other wildlife during the morning hours). 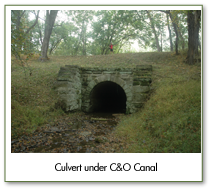 You will also want to stop and check out some of the culverts that carry crossing streams underneath the Canal. At Old Town, where Michael Cresap's house lies just off the trail, you'll have your first snack "Go." By now, you will be settling into the water-powered mode of travel that pre-dated your bicycle, and you'll sense the difference between the railroad over the mountains and the waterway along the river. Soon, you will be at the Paw Paw tunnel, arguably the highlight of the C&O Canal Tour, and another snack Go. Continue through the tunnel with your flashlight, and take notice of the rope burns in the original wood railings, from canal boat tow ropes. After the tunnel, the tight mountain will open up to colorful trees in the most remote section of the C&O Canal trail through the Green Ridge State Forest, to the Lunch Go at Little Orleans (Fifteen Mile Creek Aqueduct). Soon after this stop, you will have a choice of continuing the canal towpath surface, and seeing the Round Top Cement Mill ruins from eye level, or switching to the paved Western Maryland Rail Trail for the final 12 miles into Hancock (in that case, only the chimney of the cement mill is easily seen). In Hancock, hot showers, buffet-style dinner, and comfortable hotel beds will be waiting. On Day six, you will again have an opportunity to ride the paved Western Maryland Rail Trail, completing the ten miles to the east end, or staying on the canal surface and seeing the remains of a stone lockhouse and crossing another aqueduct. You can take a left turn off the trail to visit Fort Frederick State Park and tour the historic fort for a few dollars, as you stop for your first rest "go" of the day. Big Pool, an area where canal boats wintered, turned around, or waited while other traffic cleared, follows. At Four Locks, you will see the remains of a small town and four closely spaced locks. Leaving there, you will wind back and forth along the curving Potomac River, and will pass the remains of Charles Mill, the flatwater area above Dam #5 and more aqueducts, into Williamsport, MD, where Cushwa Basin and one of the C&O Canal visitor centers are found, as well as the Lunch "Go" (which might instead be at Big Slackwater). Here, you'll also find unique bridges, including a rare Bollman bridge, and a railroad lift bridge, as well as restored canal features. 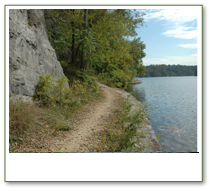 In the midst of the Big Slackwater section, you'll ride along spectacular cliffs to Charles McMahon's Mill, and hug the Potomac River on the new section that replaces the road detour used for 40 years, to Big Slackwater behind Dam #4 (where lunch may be, instead of Williamsport). Several more historic locks, buildings, aqueducts, and culverts are seen after lunch. Other attractions include a series of caves in the bluffs along the canal. The most interesting cave is Killiansburg Cave, reached on the second afternoon, which was used as shelter during the Civil War. It and another small cave just after it can be explored. If planning to explore the smaller cave, bring clothes you don’t mind getting mud stained, a good, bright working flashlight with new batteries, and be prepared to slither on your stomach for sections. This small cave has some narrow crawlways that open into rooms large enough for a couple people to stand together. The longest cave appears at mile 83.5. You can walk/crawl into this cave for several hundred feet, if it isn’t too wet. 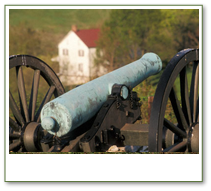 Antietam National Battlefield is a short ride from the towpath, and is an historically significant Civil War site, highlights of which you can see in an hour and a half side trip. Shepherdstown serves as the night's oasis, after a full set of experiences on the trail and in the battlefields. On day 7, Meander back onto the trail headed for Harpers Ferry, WV. Harpers Ferry includes the Harpers Ferry National Park, where people dress in period clothing on weekends, and where numerous historical events took place, including John Brown's raid on the Union Armory, which touched off the U.S. Civil War. You'll re-cross the foot bridge across the Potomac River from West Virginia to Maryland, and continue east. Day seven's trail crosses several aqueducts, including the longest on the trail, Monocacy Aqueduct, with its seven arches, just before Whites Ferry, where you will take the ferry ($2 with bike) across the Potomac River, to get to the lodging, an extra six miles by van shuttle. On your final day, you'll cross the Potomac River again on Whites Ferry, and begin riding. The trail passes by more than 20 locks and lock houses, on your way to DC, as the elevation drops 200'. At Seneca Creek, you'll cross the last aqueduct on the trail, then enter a 20 mile re-watered section of the trail—into Great Falls National Park. Enjoy the reflections at Widewater, explore the Great Falls Tavern Visitor Center and C&O Canal Museum, and enjoy views of the Falls from the National Park, Washington’s most impressive natural area. After a scenery filled day, the crowds and fitness enthusiast's presence will increase, as you complete your ride into the nation's capital. COST: $1,600 per person includes: Trail maps; cue cards; custom luggage tags; tour support/guides; 7 breakfasts, 7 large picnic style lunches, 5 dinners (Pittsburgh dinner on day one is on your own; Cumberland Dinner is on your own); tour snacks and drinks; 7 nights lodging (double occupancy) in hotels or B&B type lodging; baggage shuttle between hotels; periodic support along trail; and transportation from Washington, DC to Pittsburgh, PA, including bike transport, with time to explore Pittsburgh on the afternoon of the first day. NOT INCLUDED: Rental Bikes. Quality Trek hybrid rental bikes are available for the trip from Get Out & Go Tours for $100.